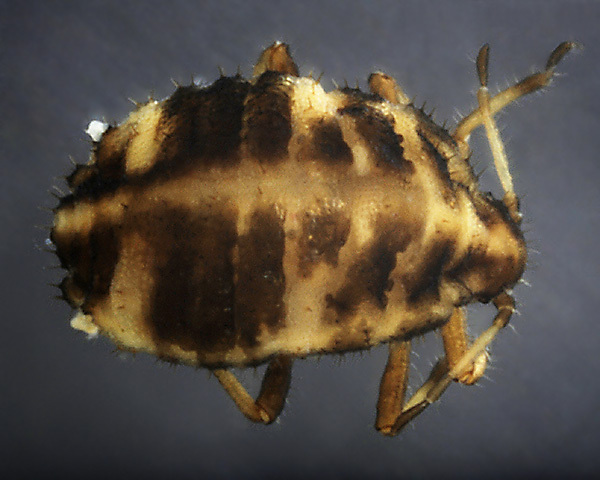 Wingless viviparae of Glyphina betulae are dark green to almost black with a pale spinal stripe and four pale spots. The antennae are short. The dorsum has wart-like cuticular ornamentation and is coated with thick spine-like hairs, best observed on the micrographs below. Siphunculi are present as pores on small cones. The body length of Glyphina betulae apterae is 1.2-2.0 mm. Glyphina betulae alatae (see second picture above) are dark green, with a dark brown to blackish head and thorax. 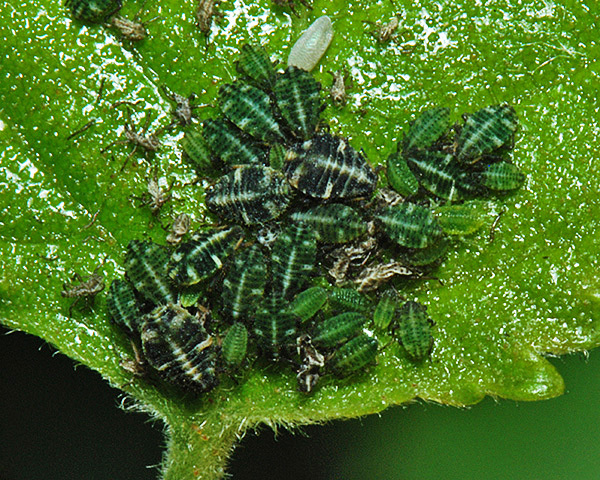 The immature stages are green. The abdomen bears numerous tubercles and the siphunculi are short and truncated. The micrographs below show an aptera dorsal and ventral. The green birch thelaxid does not host alternate but lives in colonies on young shoots of birch (Betula spp. ), especially silver birch (Betula pendula). Glyphina betulae may occasionally also be found on alder (Alnus spp.). Winged forms are found from mid-June to late July. They are usually ant-attended. The life cycle is shortened with oviparae appearing in July, and apterous males in August. Glyphina betulae is found throughout Europe, and across Asia to Japan. It has been introduced to North America where it is now widespread. 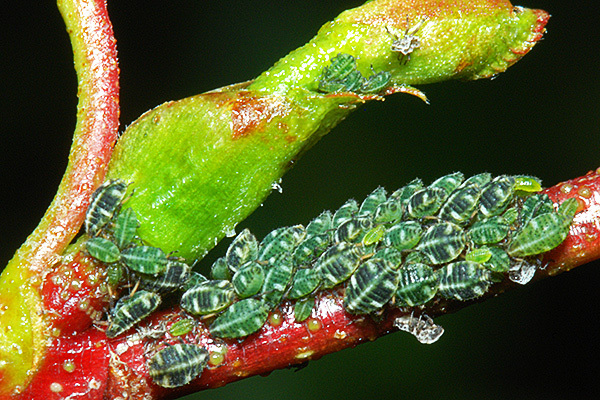 Most of the year the cryptic green coloration of Glyphina betulae provides effective colour matching with the green birch leaves, but sometimes birch twigs are a vivid red colour, and in this situation the aphids show up rather clearly (see picture below). 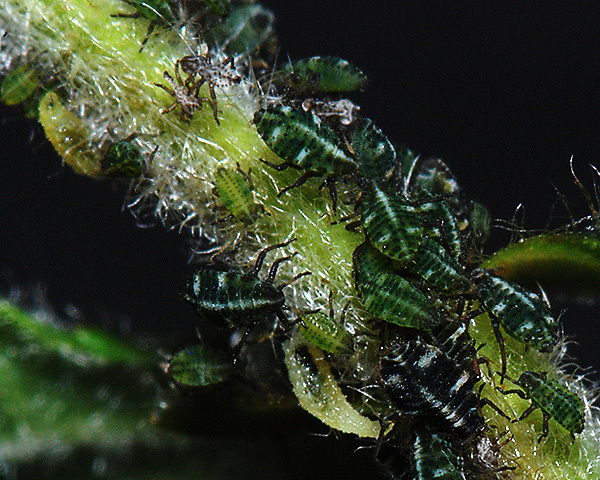 Glyphina betulae is one of only a few aphid species which have a shortened life cycle, with sexual forms appearing in summer, rather than autumn which is more usual for aphids. Such abbreviated life-cycles are thought to be adaptations to extreme climatic conditions (Danks, 2004). The picture below shows a small green male copulating with a larger yellow-green oviparous female in August (the pair are in the centre of the picture - the male is the one with the silly grin). The oviparous female has the head, thorax and abdomen green with a yellowish stripe on the spinal area of the dorsum. The conspicuous antennae and legs are pale yellow. The much smaller male has the head and pronotum greyish brown and the rest of thorax and abdomen green with a greenish-yellow longitudinal stripe on the spinal area (see Wieczorek et al., 2014) . 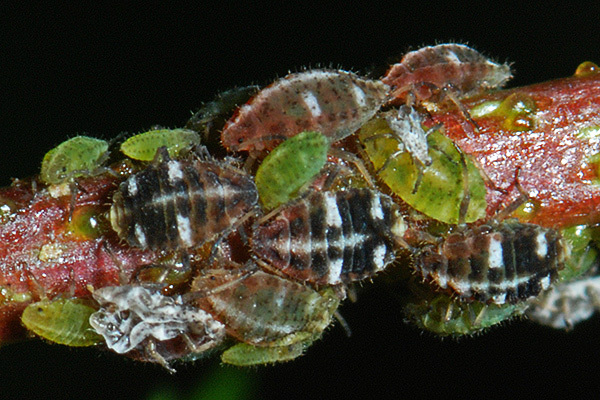 Glyphina betulae is often found in close association with other ant-attended species of birch feeding aphids, for example with Symydobius oblongus (see picture below). We have also found the green birch thelaxid (Glyphina betulae) on (what appeared to be) Betula pendula living in mixed colonies with its much rarer close relative, the brown birch thelaxid (Glyphina pseudoschrankiana, see picture below). Niche separation between these two species is normally achieved by their differing feeding preferences, with the green birch thelaxid found on Betula pendula and the brown birch thelaxid preferring Betula pubescens. We are not aware if this difference in preference is reflected in any morphological characters - for example we might expect the brown birch thelaxid to have a somewhat longer apical segment to the rostrum, given the hairiness of Betula pubescens (see situation with Uroleucon species on Leontodon and Moran, 1986). Mixed colonies of Glyphina betulae and Glyphina pseudoschrankiana have previously been found on Betula pubescens (Wieczorek et al. (2014)), but not on Betula pendula which our host tree appeared to be, given its lack of pubescence on the twigs (see picture above). 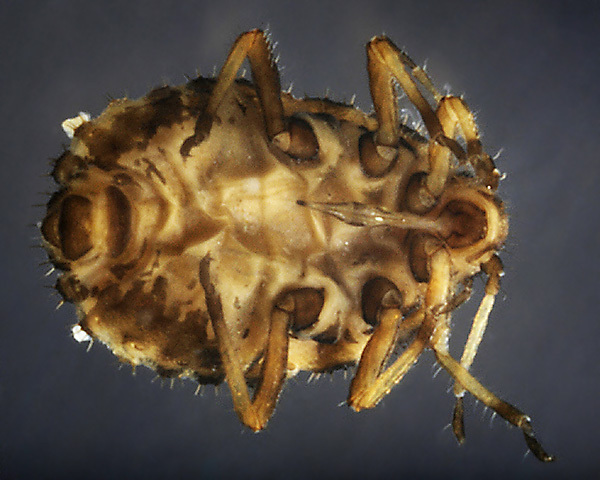 We suspect that the host in this case was a pendula-pubescens cross, which do occur occasionally in British woodlands (Brown et al., 1982), and can host an interesting mix of aphid species. 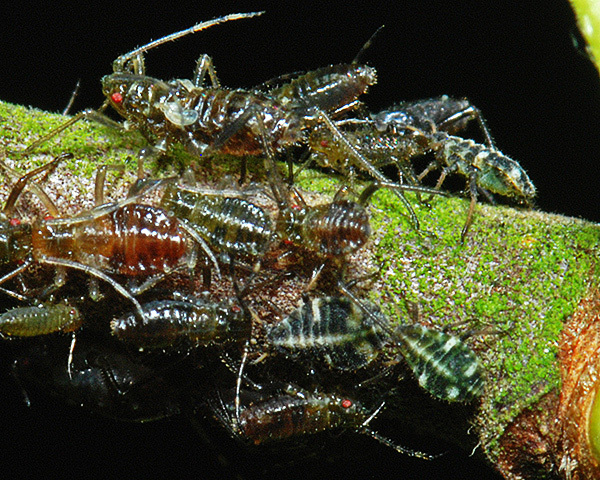 Ant attendance is clearly important for both Glyphina betulae and its ant partners, since the aphids are rarely found unattended. Mahdi & Whittaker (1993) compared populations of insect herbivores on birch trees that were either foraged, or not foraged, by Formica rufa. 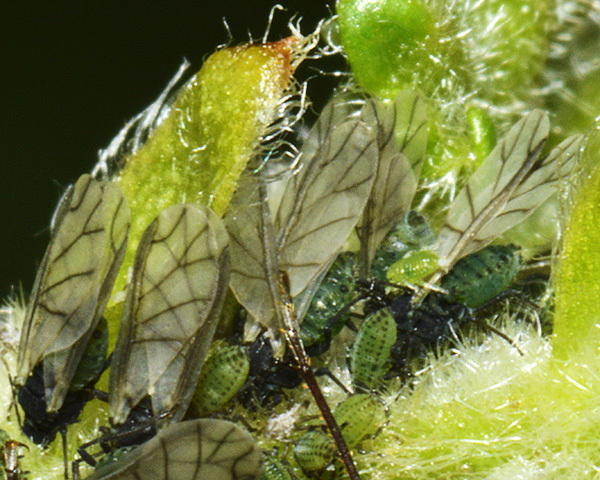 Of the seven aphid species feeding on birch, only the two that had mutualistic relationships with ants (Glyphina betulae and Symydobius oblongus) were increased by them. The large colony shown in the picture below was avidly tended by southern wood ants (Formica rufa). 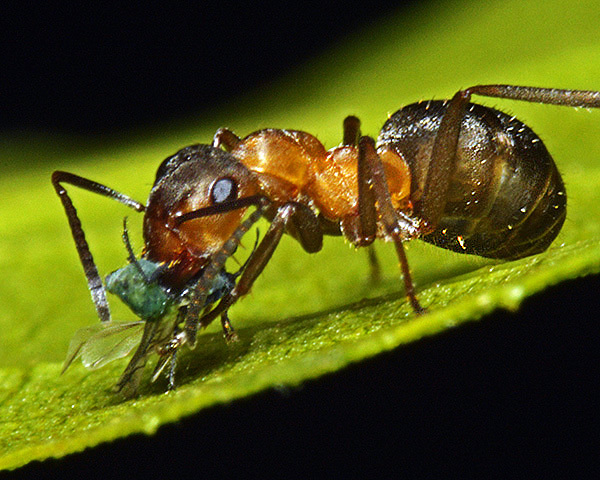 Glyphina betulae may also be tended by Lasius ants (see picture below). 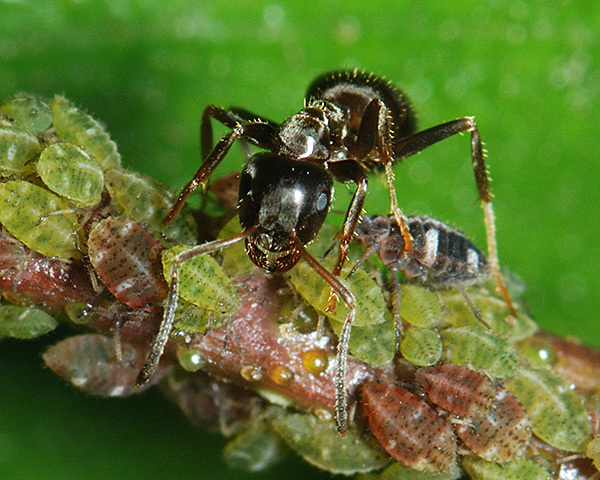 In the photo above the ant is tending a mixed species colony of the two Glyphina species. Novgorodova & Gavrilyuk (2012) working in Siberia found that Glyphina betulae was tended by nine different species of ants, and as such was one of the most ant-attractive species in the area. 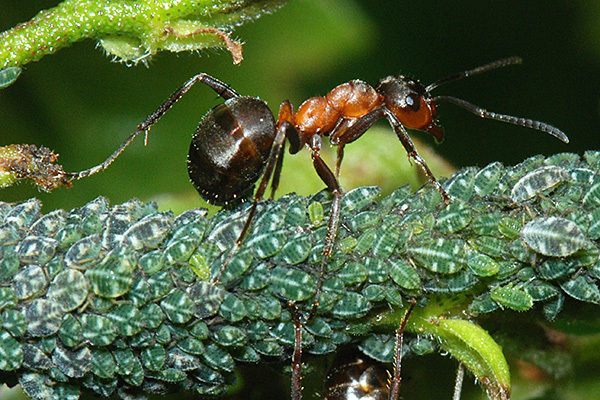 Although Glyphina betulae is tended by ants, it is also sometimes predated by ants, as evidenced by the picture below. Such behaviour is not unusual and has been recorded many times before (e.g. Way, 1963). 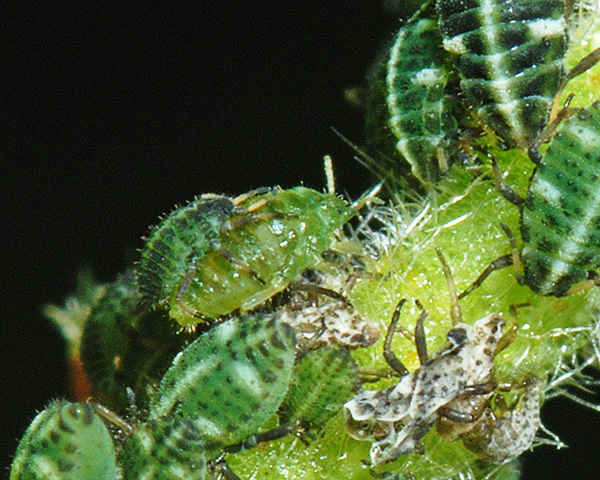 There is evidence that such predation is dependent on aphid density, and also upon the honeydew production of the aphids (Sakata, 1994). 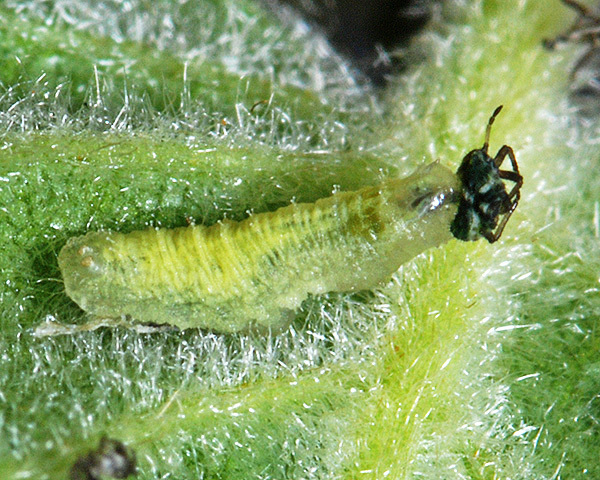 Other predators observed include cecidomyiid larvae (see first picture below) and syrphid larvae (see second picture below). However, such predators were only observed in colonies that were not attended by ants. 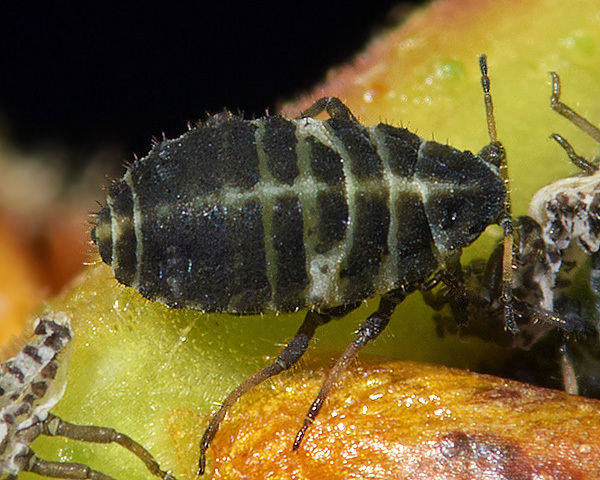 Blackman & Eastop list about 72 species of aphids as feeding on birches worldwide, and provides formal identification keys for aphids on Betula. Of the 17 species on Betula pendula, Baker (2015) lists 14 as occurring in Britain: Betulaphis brevipilosa, Betulaphis quadrituberculata, Calaphis betulicola, Calaphis flava, Callipterinella calliptera, Callipterinella minutissima, Callipterinella tuberculata, Clethrobius comes, Euceraphis betulae, Glyphina betulae, Hamamelistes betulinus, Monaphis antennata, Stomaphis quercus and Symydobius oblongus.